When new neighbors move into the building, I give them some chocolate and a little note saying hello and welcome. Just a little bit ago, I noticed a new couple moving into our building. I didn't want to bother them while they were moving (which is never fun), so I just stopped by and dropped off some chocolate and introduced myself. Now, when we happen to pass each other in the hall, we stop and chat rather than just mumbling a short "hi". A friendship in the making! So yeah, new neighbors? You can expect some chocolate from me! Plus, does this Lindt chocolate have the perfect packaging for this?? It totally ties into the whole message I'm trying to send. A simple, friendly, Hello. Can I let you in on another secret? When buying some chocolate to gift to a new acquaintance, buy some for yourself, too! I mean, who can pass up these yummy flavors. 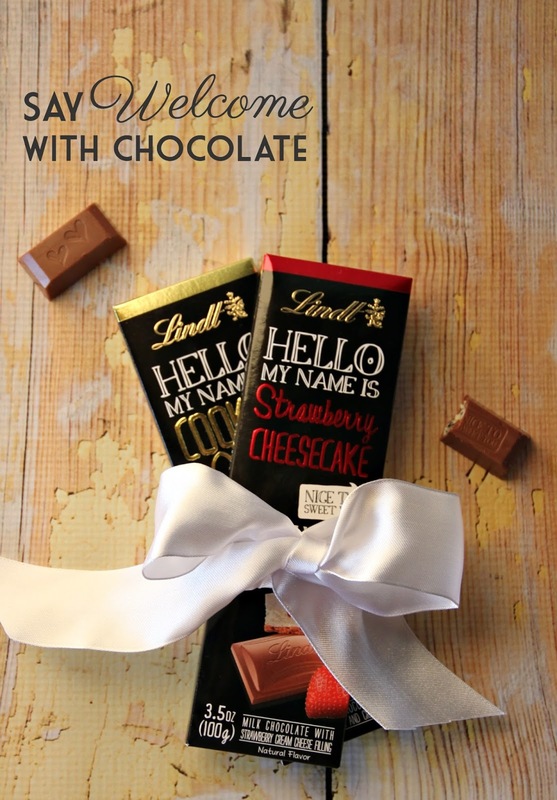 These cute Lindt chocolates come in Caramel Brownie, Strawberry Cheesecake, Crunchy Nougat, and Cookies & Cream. Is your mouth watering yet? Which flavor of Lindt Chocolate do you want to try? Be sure to check out this fun rom com video series by Lindt Chocolate anddd enter the Sweet Connections Sweepstakes! This post is sponsored by Lindt and the Linqia Community, but all opinions, as always, are my own. I was at two different grocery stores this weekend and couldn't find these - all of these posts are making me so hungry! !